The veteran goalkeeper and face of the team offers his thoughts on the club's difficult decision to part ways with a legend and what's necessary for Colorado to get back on top. It’s among soccer’s unwritten rules: club legends have longer leashes. We’d like to think the bottom lines—points in standings and butts in seats—are the same for everyone. Sports are a meritocracy. But supporters also want to cheer for those whose bond with their team is as deep as their own. A club legend’s success strengthens and validates that bond. So it can be worth waiting for. It’s no small thing to fire a club legend. This is no gun for hire you’re escorting from premises they helped build. They're someone whose contributions and character comprise an important part of the organization’s history and identity. And what’s a club without identity? The Colorado Rapids have flirted with that question for two decades. They wore green, then blue-and-black, then burgundy. They moved to a stadium in a place called Commerce City, where for a while there wasn’t a whole lot of commerce. During MLS’s second decade (2006-2015), when the league leaped from 12 members to 20, Colorado was the only team never to reach 16,000 in average annual attendance. It avoided acquiring high-priced stars. And it never finished above fourth in the West. But through it all, and capped by an unexpected sprint to the 2010 MLS Cup championship, there was Pablo Mastroeni. He’s easily the Rapids’ all-time appearance leader. He captained the club to its only title, represented it while with the national team at a World Cup and multiple Gold Cups and in 2014, took over as coach following the disappointing departure of Oscar Pareja. If there was a Rapids Rushmore, there’d be a carving of Marcelo Balboa and three of Mastroeni. Everyone wanted him to see him succeed. And so he was given ample time to do it. On Tuesday, that time finally ran out. Last season’s run to the Western finals—which followed eighth and ninth place finishes in '14 and '15—wasn’t enough to cushion this year’s slide toward the cellar. The Rapids (6-12-4) are losing and have been tough to watch, scoring the second fewest goals in MLS and creating the lowest number of chances by far. Attendance is down slightly and sporting director Pádraig Smith, an Irishman who joined the front office in late '14, appreciates the importance of club icons but always was going to assess one in Denver more objectively. So he made the call to fire Mastroeni, believing it was necessary but also understanding that messaging the move was crucial. 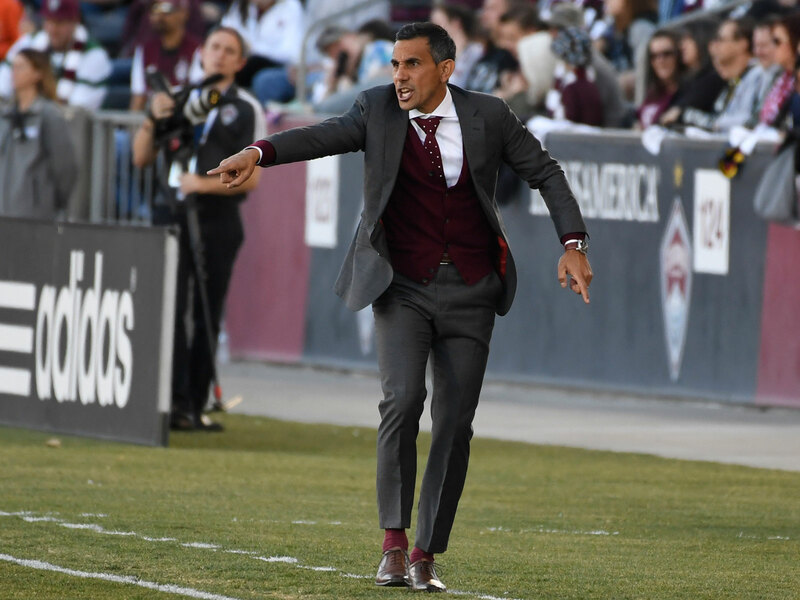 That Q&A, during which Smith responded live to Rapids supporters, was part of the club’s effort to explain Mastroeni’s departure and lay out a new path. Smith and interim CBO Wayne Brant got The Denver Post to publish their op-ed headlined ‘A promise from the Colorado Rapids front office’ on Wednesday–that's not typical for a major U.S. daily–and then Thursday, the man who’s now the face of the club spoke to SI.com about the change. Howard made it clear that this was not the case of Mastroeni losing the locker room or the trust of his charges, despite the record and recent results. That fact would warm the heart of a coach who downplayed the reliance on statistics in a sport he felt depended so heavily on intangibles. Even legends must answer to the bottom line, eventually. But that didn’t make it less necessary. In the Denver Post piece, Smith and Brant helped draw the distinction between a past symbolized by Mastroeni and the direction management feels the club must go in a league that’s become more competitive, dynamic and expensive. Howard—who knows he’ll have more to do playing behind a bolder, more creative team—concurred. One can’t depend indefinitely on mistake-free, defensive football and 1-0 wins. The Rapids raised some eyebrows when they signed Howard last year, only because it was so rare to see a team use one of its three Designated Player slots on a goalie. Typically, they’re reserved for creators and finishers. But a top netminder can be vital on a team that scores so infrequently, and Howard’s leadership (on display this week)–not to mention his gravitas in an MLS market that usually lacked it–has paid dividends. “If I was running the team, I would’ve been the first signing I made,” he said, pointing out that everything looked pretty good as Colorado finished the 2016 season on a 4-1-3 run before ousting the LA Galaxy in the playoffs. Howard’s signing indicated ambition and an understanding that connection and cachet matter, as did the multi-million dollar acquisition of Shkëlzen Gashi. In recent weeks, the Rapids have added Stefan Aigner, Josh Gatt and Luis Gil—all players who like the ball at their feet and a defender on his heels. That's representative of the club Howard expects the Rapids to become. The break with Mastroeni represents a kind of break with the past. It’s doesn’t tarnish the midfielder’s legend. Nothing can take away the years of devotion, the leadership, the mustache, the quotable quotes or the 2010 title. But a club needs more than one legend, and Colorado has been in danger of being left behind as MLS grows. Smith is a devotee of the trappings of modern football—sports science, data and analytics, etc.—and he’ll bring those to bear as he looks for a permanent head coach and players who can take the team forward at the right price. Meanwhile, interim manager Steve Cooke will lead Howard and Co. out against visiting D.C. United on Saturday. Colorado will be looking for its first win in seven weeks. Howard chose to speak out because he thought it was necessary to deliver a “clear and concise” message from the players, so that everyone involved or interested “has no questions as to where we’re going.